Available in White w/ Silver only. Black w/ Titanium out of stock. USA sales only ~ sold in other countries by local distributors. 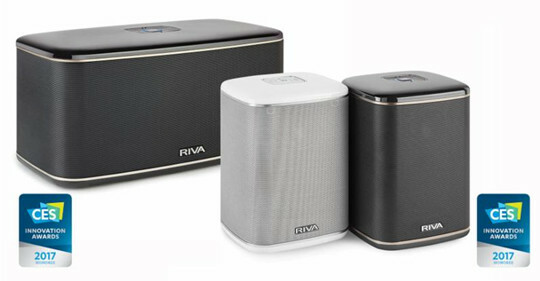 The RIVA FESTIVAL lets you play all of your favorite audio hassle free, from any source, and anywhere you want. The flagship model in RIVA’s WAND series, it delivers Stereophonic Sound for an unrivaled audio experience and modern lifestyle compliment. Perfect for music enthusiasts craving a LIVE audio experience in small to large rooms of any environment. Proprietary audio technology that enlarges audio image while allowing the signal power of the audio to be reproduced without excessive compression. True audio reproduction of your music with a 300 degree sound field that can’t be found anywhere else. It's an algorithm that upmixes two-channel stereo sound to three channels, which in this case is a tweeter and woofer on the front and a tweeter and woofer on each side. This provides a much greater sense of space and depth, without the tight sweet spot you get with two-channel systems. It also gives much more bass than you’d expect from its size. With six active drivers and four passive radiators, expect that big, rich, immersive sound you’d normally experience from a traditional hi-fi system. For both iOS and Android™ devices. Convenient remote control app in multiple languages designed to operate the RIVA WAND (Wireless Audio Network Design) Series speakers directly from your mobile devices, and personalize your audio streaming experience. The RIVA WAND app offers advanced features including custom EQ settings and playback from local music sources such as USB, AUX and optical inputs. Set up zones in your house with multiple RIVA speakers - assign different music to different zones, sync all zones to play the same music, turn two RIVA speakers into a stereo pair. Can be used with Wi-Fi or Bluetooth! We were introduced to RIVA by our long time friend and industry affiliate, loudspeaker engineer Don North. After news of his involvement with RIVA, we knew that listening to their new flagship Festival speaker was a must. Since we live, eat, and breathe speakers here - it was refreshing to know the drivers and enclosure were being taken seriously in a lifestyle type of product. Our own Festival speaker has made the rounds in our offices and warehouse, as well as personal home listening sessions. Needless to say, we're all quite impressed. It has the ease of operation we have come to expect from modern streaming devices, but actually stands out as a legitimate high fidelity device. A little more info on Don: He is a lifelong audiophile and a Caltech graduate with 5 speaker innovation patents. With over 18 years of professional experience in the audio industry, he is regarded throughout the industry as a true “tonmeister.” Don has invented and developed state-of-the-art transducers from 1″ through 18″ and loudspeaker systems for companies including Apple, Beats, Ford, Monster Cable, McIntosh Labs, Legacy Audio, Epson, Pioneer, Aurasound and many others. Our experience with speaker break-in also applies to this system. These robust drivers need a little time to open up. As the soft suspension parts break-in, the high frequencies become more detailed and spatial, the midrange more life-like and present, and bass extension more authoritative. Brand new speakers oftentimes seem a little dull and closed in sounding right out of the box - maybe not bad, but not up to expectations or their ultimate potential. A couple weeks of normal play is enough to make a noticeable difference, with continuing improvement over the following months. As much as we would like it, the grill wrap is not meant to be removed. This view is to show what lies beneath the decorative casing. Modify at your own risk. Please note: "Wireless" refers to streaming music to this device. To power it, you still need to plug it into a wall socket or other 100-240V source. This is my first experience with Madisound. The customer service rep was professional and very helpful. I ordered the Riva wireless speaker on Thu afternoon and it showed up on my doorstep in IL less than 24 hours later. The price was $100 less than anywhere else including Amazon, plus no tax and no shipping. After two months the speaker is only sounding better. The bass is as good as many larger speakers and the midrange is amazing. I'm hearing things in songs that I never heard before. The speaker synced up with my network quickly and it works really well. I use Spotify and it is so simple to use my iPhone and iWatch to control the speaker. 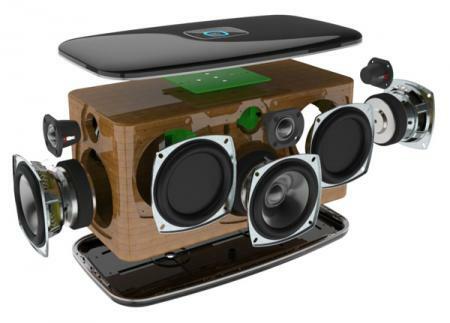 I have nothing but good things to say about Madisound and the Riva speaker. No, I am not a paid spokesperson.